Asha Harvey has been doing voiceover work since she was a very little girl – it may have come about from being dragged along with her dad, Simon, to his voiceover sessions since she was only 6 months old! 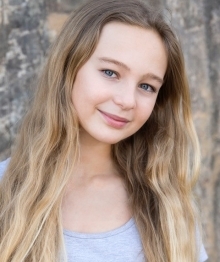 Now, as a bigger kid, she has cemented her own abilities in the studio and always impresses clients with her outstanding reading ability, willingness to take direction and an understanding of subtlety and nuance when reading a script that is beyond her years. Asha draws on a wide emotional range and can deliver an acted read with real authenticity. A testament to her ability was when she was recently chosen to voice a lengthy corporate narration for one of Australia’s biggest property developers. The finished video was wall to wall narration by Asha running almost seven minutes. Four or five full takes were recorded in a 90 minute session to complete the project. It was a very impressive performance for a child voice artist. Despite all this she’s a happy, giggly kid, who loves dancing, drawing, netball, and most of all….puppies! Asha really loves doing her voice work and may very well be the right kid for your job.